In the downloads section you will now find new variants of FW010 that you can try if you experience problems with the older FW010 on your system. These FW files have the same functionality as the older FW010, but since they give different routing inside the FPGA, they may help you avoid problems with FW010 that you did not experience on FW009. Also in the downloads section are files for FW011 with extra routing variants. New in this FW is that the superblitter FIFO has been increased from 512 longwords to 2048, i.e. it can now hold 4 times as many blitter jobs. Also added a simple free running debug counter that counts at the CT60 clock frequency. This can be use for timing stuff very accurately. We have a bugfix for Natcar that enables the Jaguar gamepads. They where accidentally disabled in the first preview. You need to download the whole zip again. We have just added a demo of our first SuperVidel game to the downloads section! It is a Supercars inspired racing game with 1, 2 or 4 players support, using keyboard, joysticks or jaguar gamepads. Currently there are 7 race tracks in the championship. The game has only been tested under Mint 1.17, and requires a partition with long filename support. For other requirements, see readme.txt in natcar.zip. The source files for the new Svethlana driver are now available in the Downloads section. used to give us 70KB/s, but now we get 1.5MB/s! You need both the new FW v010 and the new Svethlana driver, both on the Downloads page. Note that the FW is available as both straight MCS-files (in a ZIP-file for use under Xilinx Impact) and as our own SVUPD010.APP for updating without JTAG dongle. Note also that the driver has only been tested under Mint 1.17.0, and we have indications that it may need recompiling under newer Mint versions to work there. We will make the source code available here soonish. We just added the SuperVidel firmware updater SVUPD with built in FW v009 to the Downloads section. Just uploaded a new FW for the SV. :) It has the DDR clock set to the somewhat lower 200MHz (but still up from 185MHz in the older FW versions before rev 7). A new key feature is a FIFO for the SuperBlitter where you can queue up to 56 blitter operations. The odd number comes from that the FIFO has room for 512 longwords, and each blitter operation needs 9 longwords. Note that you need a JTAG cable to update your SV using these files. This is a security measure, so you can restore your SV if something went wrong. An update program with the v009 FW built in may appear soonish. The SuperVidelMemoryMap.pdf has also been updated to show this added FIFO in the registers. We are currently making changes to our Nature website so that it will look a bit better. Please be patient with stuff that does not work as it should for a while. We have just released v006 of the SuperVidel firmware. You find it on our Downloads page. Remember to reload that particular frame or you may not see the page correctly. News in FW v006: Optimimized CT60 clock from 75 to 85MHz. Register bit for triggering Blitter done interrupt. You may be surprised about the low CT60 clock frequency, but the numbers come from our Xilinx software which is quite conservative. The FPGA itself can handle quite a bit of overclocking. Updated the SuperVidel installation manual to included an FAQ section on how to upgrade your ABE and SDR chips of your CT60. We forgot to announce that there is a new firmware available for the SV under Downloads. In revision 5 we have fixed a problem with move16 writes and let all 2bit video modes use the ST palette. Changed the main page to include a link to atari-forum.com's SuperVidel section. You need to reload that particular frame on the start page to make the browser reload it. The SuperVidel installation manual was updated yesterday (July 4th). We are now content with the firmware update program and procedure. The program has been put under Downloads, and we have updated the installation manual and other docs there too. Meanwhile all SuperVidels but 14 have been tested, and only 3 failed. The remaining 14 needed minor repairs by the manufacturer and have just returned from them. So they are ready for testing. The three failed Svethlanas have also been returned to the manufacturer and they will replace the components that we think are broken. The shipment process has been started again, but please don't flood us with questions about when your board will be sent. All the Svethlanas are now tested, only three out of a hundred didn't work. No more Supervidels have been tested because the last two months have been spent on fixing bugs in the firmware and drivers. We have started and stopped shipping of boards a few times now, because of unforeseen problems. Right now we have stopped shipping again because the supervidel updating procedure was not failsafe enough and we need to add more checks to the updating software regarding ABE version and such. In the mean time we have started testing all the other SV boards together with Svethlanas. About 40 SV and 65 Svethlanas have been tested. One Svethlana and a few more SV have not worked. Some of the SV boards have visible defects which we can fix. We have started packing some shipments but have not shipped them because we are currently waiting for new drivers from Pep and we need to fix some bugs ourselves. The four prototypes of the SV all worked fine so we told the manufacturer to go ahead and produce the remaining boards. They are almost done now, but the pick and place machine ran out of one or two components which they now are waiting for before they can finish. Meanwhile we have started testing the Svethlanas and 1/3 are now tested. 100% work so far. Quite a few people who did not prepay for this batch have emailed us asking if they can buy a board. We will set up a small webshop on our webpage "soon" where you can reserve one (1) board per person. We set this limit since there will only be about 17 boards left over when all prepaid ones are sent. You must pay within a few days after reserving a board, otherwise the reservation is cancelled. Payment details have not been decided yet. So far the first SV rev2 prototype that we have tested has worked 100%. We are now using it daily, with full DVI and VGA functionality, which also proves that the DDR2 memory system works fine too. We had replaced the old DDR2-667 chips with DDR2-800 chips because of cost and availability, so that was a bit scary before testing. The DDR2 RAM is still only run at 185MHz (DDR370) because of FPGA limitations. We might be able to go up a few MHz later though. One of the new Svethlanas is being used for networking, and that works fine too with its new 45-pin FPC cable and connector. This replaced the old 1.27mm pitch connector and cable because of the cost of the cable. The new motherboard clock connector on the SV rev2 has been tested by feeding the 25.175MHz VGA clock from the soldering points just right of the large motherboard capacitor, and then verified that the SV rev2 chooses that clock for VGA Videl resolutions. So right now it seems very likely that we can tell the manufacturer to go on and make the remaining SV rev 2 boards on January 7th when they start again. We will continue the verification after Christmas. At first they had been pessimistic about making it before Christmas since the chinese subcontractor of the PCB laminates didn't deliver them last friday as promised, but yesterday. We will pick them up tomorrow during lunch and post some pictures here later. We learned today that the empty PCBs may take until the end of week 50 to get back from the subcontractor. The main manufacturer who mounts the components on the PCBs said they are only working until the end of week 51. And they have a really busy schedule, so it will be a very close call if we get the 4 prototypes before Christmas... :-( They will not open until Jan 7th again. So if we're unlucky, all of Christmas and New Year will be wasted time. We now hope that the PCB production and mounting of components will not take too long, so vi can get the 4 prototypes before Christmas. Then we need to test them and adjust component values during Christmas. A few days ago the manufacturer told us that all the Svethlanas have now been produced. :) We have not got them or seen them yet though. Earlier this summer our company where we had our daytime jobs (not Gilda Electronics) went bankrupt and since this company was started by Torbj�rn and some friends in 2003 a lot of time and effort has been put into trying to save what's left. On top of that we've had to find new jobs and right now we're moving Henrik's stuff to a new apartment because the current one will be torn down. As you hopefully realize there's not a second left to work on the SuperVidel because of this. On the other hand, meanwhile we do all this, the components should be on their way to the manufacturer. So there should be no leadtime left when we've redone the layout. During the moving to the new apartment, the server will temporarily be unavailable and you won't be able to read this news page or access the SuperVidel and EtherNat registration info for a few days. 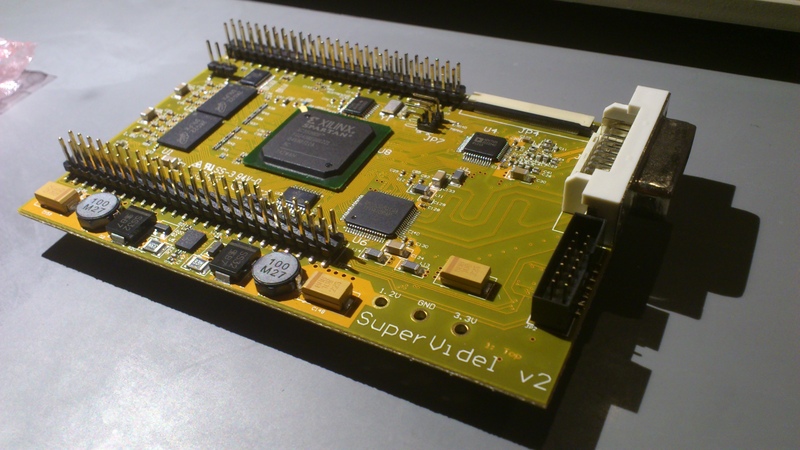 Recently we finished redesigning some of the inner logic of the SuperVidel FPGA design. The goal was to move the data cache from the DDR clock domain to the CT60 clock domain, and make the blitter write directly to the DDR memory, and not to the old cache. This should speed up the blitter several times. Now that most of it is finished we have seen a 3.5 times speed increase in the blitter, and reading from the 060 should be faster now too, but has not been measured yet. The PCB manufacturer came back to us and said that the PCB layer stackup that they earlier had accepted is now not producable. So we'll have to change lots of via sizes and trace widths to get the right impedances using their correct stackup. They will start buying the components immediately, but vacations are starting now so they couldn't tell how long it should take before all components have arrived for the production. But we're hoping for September. We got home from Sommarhack on Sunday evening. It was an awesome party as always, with its relaxed atmosphere and beautiful surroundings close to Dal�lven. The weather turned out to be much better than predicted too. Pep worked on his drivers, Henrik on a GUI FW update program, and Torbj�rn on a rewrite of some of the VHDL code to get a much faster blitter and 060 read/write accesses. The SuperVidel prepayment period has taken a lot longer than we had hoped. But now we're very close to 80 paid boards which we guess is a level that is possible to produce. We just have to ask the manufacturer for a last quote since we no longer will make 107 boards and the USD has been very turbulent the last month or so. Almost all components are USD based, but we have to pay the manufacturer in SEK. If the quote is OK we should be able to start the production immediately. But then we still have to wait for the lead time of the components of up to 9 weeks, and the 3 weeks vacation time of the manufacturing company. Hopefully they coincide. Just wanted to say that my ADSL-modem went crazy after a thunderstorm yesterday. It's now up and running again, so that you may access our server again. It shows parallax scrolling in 640x480 8bit chunky mode using the blitter. Just added the "SuperVidel installation manual, rev1" to the Downloads page. :) It describes how to install the SuperVidel into some different types of cases. But it doesn't cover the Svethlana and Extender installations. They will appear in other installation manuals. Just got the connectors from China. They look good, but we must count them at home to see that all are there. These are the connectors for the SuperVidel, Svethlana and Extenders. We just deactivated the old PHP files, since we saw that some people have used the old files by mistake. If you get a "permission denied" when trying to update your registration, clear your caches/history and it should work. NOTE: Clear your web browser cache, or you will see old versions of our PHP files and the main HTML file! We have updated our PHP scripts so they contain all price variants of each product, and payment methods. We accept EUR and SEK, and bank transfer and Paypal for payment methods. Note that Paypal charges ridiculous percentage fees and has very poor exchange rates from EUR to SEK (SEK is what we get in the end), so the prices when using Paypal are up to 6% higher than using Bank transfer. You will see all these prices if you go to the main page, select the SV registration button, and then update your old registration or make a new one. If you have lost your password, please email us. Even if you don't want to change anything, you must update your old registration to be able to see the summary so you know how much to pay. Forgot to mention that we have updated the SuperVidel project page with the last specs before production. You'll find it under Projects. We got new quotes from the Chinese supplier, and they looked OK, so we will order the connectors as soon as possible. We have included these prices in the SV, Svethlana and Extender boards calculations. We have decided the final prices for all three products now, in Euro. You find them under the SV poll page, which you get to from the Start page. There you can update your number of boards too. Unfortunately the somewhat better component prices from the manufacturer didn't do much for the final prices. Note that the prepayment period has not yet started. Since we're in Sweden we get all your payments converted into SEK, and the exchange rates we've seen on our bank and Paypal are not so good. We've not yet decided if we should go ahead and accept Euros anyway, or translate the Euro prices into SEK, so you send us SEK instead. For those of you who live in a non-Euro-country it makes little sense to convert to Euro (at a possibly lousy rate) and then we must convert from Euro to SEK (at another lousy rate). Finally we got an answer from the Chinese connector supplier. Now we'll just verify that their old quotes are still valid, before placing an order. When these prices have been verified, we should have everything we need to be able to finally set the prices for the SV, Svethlana and Extender boards. We visited Vinterhack in Tidaholm this weekend. It was the same old guys as always and great atmosphere. The party place was new though, and it was very good. While there we worked on the SuperVidel project with Pep. He added more stuff to the XBIOS+NVDI drivers and we added things to the VHDL code. Now we have a SuperBlitter-done interrupt, and separate VSYNC interrupt vectors for the VGA and DVI outputs. Also added a new 32bit alpha blitter mode, but had no time to test it. We have emailed our chinese connector supplier to verify offered prices, but haven't heard anything yet. These connector prices are necessary for the SV and Extender boards, but not for the Svethlana. We had some discussions with the manufacturer, and got more sensible prices on some components, but not all. We pointed out to the manufacturer that some component prices were way too high and now we're awaiting their adjustments. This might take a week. The SVEthLANa has also been struck by the high startup costs. 30EUR + VAT is no longer realistic. It will be more like 40EUR + 25% VAT. We haven't determined the final price for the Extender-boards yet, but we have decided to let people buy them separately even if they don't buy a SuperVidel. The manufacturer phoned us today and told us we should get the quote tomorrow or the day after that. They had some questions to be answered before they can put the quote together. But they were no big issues so they should be able to finish it now. Yesterday we emailed the manufacturer, so now we're waiting for a quote from them. :) It should normally take 2 weeks. Just finished the Gerber files and BOM for the Supervidel! :) They are ready to be sent to the manufacturer. We need to do this for Svethlana and the Extender boards too, but they need no additional checking since we have already tested this version of the Svethlana by soldering one ourselves. Finished checking the schematics today. The layout is next. Finished the list below and started comparing all schematics to the 3 years old ones (for the prototypes) to more easily see what we have changed. The last 3 weekends we fixed all DRC errors, and then we went through an old list of things to do and check, which we're almost done with too. Yesterday we fixed most of the DRC errors/warnings. Not 100% done yet though. Placed those vias too. Did a DRC check of the layout and found that we have a bit of work to do there too. If you're wondering why nothing has happened lately on the SuperVidel or anything else, that's because our regular jobs currently demand that we work evenings and weekends to get things done for a deadline soon. Hopefully things will get a little less hectic in October. This weekend we were at Hackspett 2011 in Falk�ping. It replaces the old Atari-only event NAS, but is still organised by SAK. Other platforms were invited, but we mostly saw the same old guys who mostly brought their Ataris, but also the odd Amiga, C64 etc. During the event we helped Pep input the timing register values for a 1920x1080p 60Hz (mono to 32 bits) resolution into his SV_XBIOS.PRG. This resolution is now selectable from his modified TOS resolution changer (looks like the original), which uses Vsetmode() using the two-byte modecode. So we used 1920x1080 during the party in XaAES under Mint, on a DVI TFT screen. To get this high resolution we used the so-called VESA CVT-RB (reduced blanking) timing, to reach high resolutions with a reduced pixel clock (138.653MHz in this case). Our 24" TFT had no problems with this timing on the VGA input either, so as long as you have a resonably new TFT screen, it should work for you. Pep was otherwise deep in his work rewriting his SV_XBIOS program, and Henrik was busy coding other things on his falcon. I (Torbj�rn) added a new bit to the SuperVidel copy of the 0xFF8266 register, which controls the colour depth of the Videl. The new bit enables 8-bit chunky mode in Videl resolutions on the SV output. This way you can easily change a current game/demo which runs in 8bit planar mode, into an 8bit chunky mode application, so you can lose the costly chunky-to-planar conversion during each frame... :-) All you need to do is set this bit to 1 when writing to the 0xFF8266 register. We found it necessary to take a break from the SuperVidel stuff during our own vacation. The component price quote has not been delivered to us yet since they want all documents from us to be able to give us a full quote instead, not just for the components. We'll shortly resume the work were we left it, to finish all documents. Several more weeks have passed without any word about the price quote. But this morning we got an email were they said that they have got in all the quotes and will do some more work before sending the result to us. They said we'll have it next week. Last weekend we went to Sommarhack at Gr�d�, Dalarna, Sweden. The weather was quite a bit more pleasant this year than the last. The atmosphere was very relaxed, and it was nice to meet everyone again. Pep did some major rework on his NVDI drivers, but otherwise we did only minor things on the SuperVidel things. About a week ago we went to Outline 2011 in the Netherlands, and it was a pleasure as always, except the 15 hour car drive in both directions... :) The weather was very nice this time too, and it was good to see the old people again. Some progress was done on both the PCB layout, VHDL code and VDI/NVDI/XBIOS. For example, we now have working Videl compatibility output on DVI too, which we only had on VGA earlier. So the boot picture will show up on both VGA and DVI now. We haven't yet heard anything from the manufacturer about the price quote, but we hope it comes this week. They said there was very much work right now, so we're not surprised that it has taken a bit longer than usual. After a few days we got an answer from the manufacturer that they will start asking for component price quotes immediately. But it will likely take about two weeks before we get the quotes since there are extraordinarily many quote requests out there right now. In the mean time we go on layouting the final SV changes. We received the oscilloscope last week (later than promised) and made some important measurements to decide the final component characteristics. This weekend we finally completed the bill-of-materials for the SuperVidel and SVethLANa, and sent it to the manufacturer so they can give us a quote for the components. We still need to fix the last things on the SuperVidel layout before we can get the complete quote though. We hoped to have the final price of the SuperVidel ready before Outline 2011, but that will probably not happen. Just a short notice to tell you that we're still busy making the SuperVidel ready for production. At least the Svethlana is ready now. There are a few things on the SV left to modify, both in the layout and in the bill of materials. The re-registration period will run until we have a price from the manufacturer. We have got a quote for the biggest components on the supervidel. It looks promising to get a low total price. But we still need a quote for the manufacturing itself and the smaller components before we can decide the final price for all who order from us. Because we haven't yet been able to decide the final price we will prolong the registration period to at least April 1st. where we show dual screen desktop and full screen Aniplayer playback. We just had an Atari-weekend with Pep were we managed to create a dual screen desktop and also test that feeding the 25.175MHz Videl clock from the motherboard to the SV is fully usable on the SuperVidel. Someday soon we will do a 5th demo video of the dual screen desktop. We don't have a patched Quake port yet, so we don't think it's worth to show on the SV, but if/when we do it we can show that too. Also left to do is a dual screen demo. Hopefully done during the upcoming weekend. We're currently recording some demo videos to show the various aspects of the SuperVidel. We'll post them at youtube when we're done. It is now time for you to re-register your interest in buying the SuperVidel. This is because we started the poll 1.5 years ago and since then the CTPCI has been released and generally people may have lost interest. So we need to get a fresh picture of how many boards to actually produce, since that will affect the price of each unit. So please go to the SV interest poll at our main page, click the update link and carefully follow the instructions. You HAVE to update your registration to be counted, if you originally registered or updated before Feb 1st 2011. Of course we also welcome new registrations now. If you have any questions, email us! Time for a news update! Our server has been down for a while because of broken hardware, but now we've moved its harddrives into a new computer, so it should work from now on. We tested two TX slots and two RX slots with the Svethlana board, but didn't see that it was any faster than what we currently get from the EtherNat (Henrik got 1.3MB/s to/from an FTP server in the same network). In the future we can either assign more block-RAM in the FPGA to be Svethlana buffers, or implement an interface to the DDR2-RAM so we can have up to 128 buffers (max allowed by the MAC controller IP core that we use). Hopefully this speeds up things, or we need to look for the problem higher in the SW hierarchy (Mintnet). Focus now is on preparing the SV for production, as we have now decided to not add more functionality to the FPGA than we currently have. The VHDL issue that we had with the Svethlana was quickly fixed, and since then we have also managed to rewrite the Ethernat Mintnet driver to suit the Svethlana. It seems to work fine, as we can now surf the web and transfer large files to/from our server without errors. Just need to change the driver a bit so we use both TX packet slots that we have allocated block-RAM for in the FPGA, to (hopefully) get better speed. Right now we only use one packet slot. We have come as far as testing the floodping program that we mentioned below. The pinging itself seems to go faster than with the EtherNat, but we have got the same problem with the MFP interrupt collisions that we had with the EtherNat. Our current solution in the VHDL code doesn't seem to be a very good one, so we have to try something else. But it shouldn't be a very big issue. We have now got both sending and receiving packets working on the svethlana board, with interrupts too. The next step is too write a simple ping program and test the stability, while a floodping is running on an ethernat. Then we can adapt the ethernat driver to the svethlana hardware (with the mac controller in the fpga). That should'nt take long since the integrated mac controller in the fpga is much easier to use than the 91c111 chip on the ethernat. After that the svethlana work is complete and we can focus on preparing the supervidel board for production. We have decided a simple interrupt daisy chaining protocol with Rodolphe to be used when two or more boards are on top of each other on the CT60. With this in mind we have made a final JED-file to use when updating your Ethernat. The file will be put in the Download section soon. You need to install Xilinx Webpack (free) on your PC. Any version is ok.
Make sure the power is OFF on your falcon, and the Ethernat is in its usual place on the CT60. Set the CT60 to 030-mode. Earth yourself by using a wristband, or touch something grounded. Don't wear syntetic clothes. Connect the GND wire on your cable to the GND pin in the Ethernat's JTAG header. The header is in the top left corner of the Ethernat board, 7 pins long. GND is the 2nd pin from the left. See the printed pin names on the board. Then connect all other pins, except the 3.3V (VREF or VCC on the cable) which is connected last. Power on the falcon. How to use iMPACT (from my memory): Start the accessory iMPACT, press cancel if a dialog shows up, select Boundary Scan on the left. Right click in the big space and select "Initialize chain". The program will then search for the cable and what it is connected to. A symbol resembling a chip should show up. Right-click on it and select "Assign configuration file". A file selector appears. Select your JED-file and press OK to exit file selector. If a dialog appears, exit it using cancel. Right-click on the chip-symbol again and select "Program". A progress bar appears while programming is in progress. "Success" should appear in blue when it is done. Last weekend we found and fixed a serious bug in the VHDL code for the EtherNat CPLD! This fixes problems where the falcon could freeze during heavy network traffic. The bug was trigged when the MFP chip on the motherboard sent a level 6 interrupt to the 060, if a LAN interrupt arrived during a very small window when the MFP was already answering the interrupt acknowledge bus cycle. This would screw up the interrupt vector supplied to the 060 and hang the bus. The EtherNats we currently are repairing will get reprogrammed with this fix, but we have to clear some things with Rodolphe first regarding the CTPCI +EtherNat problems before we send the boards back. Work has begun again on the Ethernet MAC parts of the SuperVidel for the Svethlana board. It is not quite finished for simulation of the VHDL code, but not very much work remains. We have also taken a new look at the Ethernat driver code (the one modified by Alan H in the Freemint CVS) and the CPLD VHDL code itself, while repairing some Ethernats. We have found at least two (old) bugs in the driver which we have fixed. The source code will be checked in to the Freemint CVS when we're done. Meanwhile Torbj�rn is trying to fix a problem with synchronizing the VBL from the old Videl with the VBL of the SuperVidel when running in compatibility mode. And just now we fixed the 2bit falcon VGA mode and ST Low, Medium and High resolutions! :) So the falcon VGA mode emulation is now complete! Today we updated the SuperVidel project page, with more up-to-date specs and an FAQ. You find it under Projects. This week since Outline we've worked on the blitter and fixed some lesser bugs plus a bigger bug last night, when we solved the garbage-line bug, which some of you saw at Outline. There are still about two minor bugs before we can call this version of the blitter finished. On our way home from the Outline party last weekend, we got an idea together with Peter Persson (Pep). As you may already know, today we mirror all ST-RAM-writes to our SuperVidel graphics RAM, so that you immediately get the same screen output from the SuperVidel as is displayed by the Videl. This works fine of course, but naturally the speed is dictated by the ST-RAM writes. The mirror area in our graphics RAM is at 0xA0000000 -- 0xA0FFFFFF, which is 16MB. The idea we got was to fool the VDI into writing directly to our graphics RAM instead, by simply adding 0xA0000000 to each write and read access. This is done by manipulating the Logbase system variable. The negative side effect of this is that we no longer get the usual Videl output after we apply this patch, but we think you should be able to turn this feature on and off as you wish. We have run some quick GEM bench tests and it's about twice as fast on some tests when all the VDI accesses only go to our graphics RAM. Another great Outline has passed way too quickly, and now we're home again. The current location is really the best we've been to, so hopefully the party will be held there again. It was fun to meet all the scene people again, and witness such great contributions to the competitions as well as the fine live performances. The party was quite productive for us too, since we managed to make the blitter work in reality. There are some bugs left to fix, but the main functionality does what it is supposed to without hanging the computer. The current speed of the blitter is below 100MB/s, but that is caused by the cache and we have a few tricks left to make it faster. We're working on a blitter now, since we finally realised that even MOVE16 accesses will not give you fast realtime window movement on the desktop in higher resolutions. We had planned to make a blitter anyway, but now it got higher priority. This blitter has only basic copying, within the SV graphics RAM, of a square from one defined square buffer to another, like the screen. It is not as simple as it sounds to do this, since we have to work with bytes in a 64-bit bus environment, which requires us to round addresses to even 8 bytes and use write-masks. Hopefully we'll have something to show at Outline, besides the already functioning Videl screen cloning (for 1,4,8,16 bits/pixel). We have been informed to our great sadness that Frank Naumann passed away a few days ago. Though we never met him in person we had contact with him via email, and among other things he helped us when we began writing the EtherNat driver a couple of years ago. This important cornerstone of the Atari community will be sorely missed and not forgotten. The second problem had to do with the SuperVidel answering some reads of the old Videl registers. This is necessary to allow us to expand the functionality of the Videl, so we can restore a high SV resolution when an old game or demo restores what it thinks is a Videl resolution. We have simply selected an unused bit in the register 0xFF82C0, which is read as '1' when a special SV resolution is running, and '0' when an old Videl resolution is used. So a game/demo which reads all Videl registers before setting its own resolution, will automatically read our "magic" bit and remember it. When the game/demo exits, the bit will be restored together with the Videl registers. The SV checks the magic bit to see if it should set the Videl resolution or restore the high SV resolution. During the last two weeks there has been some major development progress on the Videl emulation again. We have got both Mono and 8-bit (256 colors) modes working in all VGA resolutions: 640x480, 320x480, 640x240 and 320x240. So now we have full support for 1,4,8 and 16 bit pixels on VGA. We have fixed minor but hard-to-find bugs that sometimes caused "skewed" bitplanes. We have run some demos that use 256 colors to see that our Videl cloning works. We have only run VGA 60Hz, since our LCD monitors can only handle this. In one demo we selected 100Hz VGA, and the monitor reported that it couldn't display "100Hz, 31.4kHz". This is good news for us though, since it proves that our Videl register translation code translates 100Hz correctly! :) We need to try it on an analog VGA to see it for real. RGB resolutions is still untested. We have not yet made mono, 2-bit and 8-bit work, but hopefully they shouldn't present any bigger obstacle now. We're currently moving our 256-colour palette from the old address at 0x80020000 to 0xFFFF9800, where it will snoop the old 256-colour palette. We will also make the VGA timing block active from power on, so you will get the boot picture directly out thorugh the Supervidel. Forgot to mention below that the Videl register settings for the VGA resolutions that we tested in simulation were taken using Screenspain after having set a resolution from the desktop. So we're testing the actual TOS settings, not our own made up resolutions. This means we should see Videl screen output being mirrored on the SV output when starting the falcon in for example VGA 640x480 16 colors. 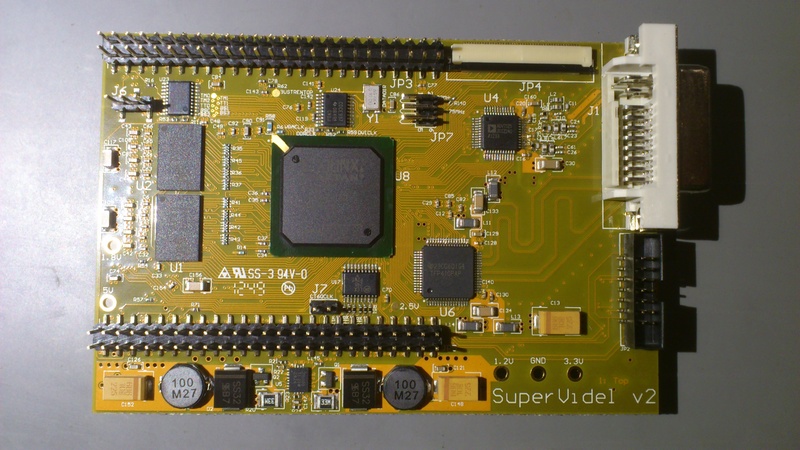 In simulation we have now verified that a VGA 640x480 16-color resolution and a VGA 320x240 16-bit one are correctly translated into SuperVidel register settings, so we get the correct VGA timing and data output. 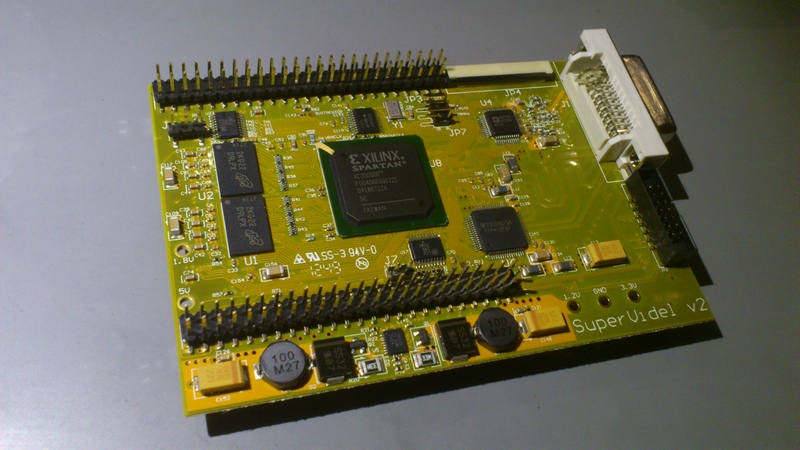 We have also run the VHDL design through the Xilinx ISE synthesis and place-and-route, and we now have the mcs-file necessary for testing the Videl translation on the SuperVidel in reality. The problem now is that my (Torbj�rn) CT60 is under repair since its motherboard connectors as well as the ABE chip were broken. And now Henrik's CT60 is also making trouble, because of bad motherboard connectors. Those connectors seem to wear out too easily when we remove and replace the CT60 on the motherboard. Henrik is now replacing the connectors with our own CT60-extender boards, to make the CT60+SV fit in the standard Falcon case. After that we can test the Videl translation. We have figured out the crashes in the Xilinx ISE Simulator at last, and have also made some progress on the actual Videl register translation. Now we get correct VGA hsync and vsync timing in simulation. Just some minor details to fix before we can test the Videl compatiblity in reality. After a bit of in-depth Videl register researching, we have implemented a Videl-to-SuperVidel-registers translation block in our VHDL code. We're following Mikro's Videl guide and just like Mikro says, the horizontal timing registers are the most complicated to get right. We're currently simulating our code and Xilinx ISE Simulator has given us some strange crashes to figure out, which of course follow no logic. But at least we're on the right track. The heavy part of these registers is the interpretation though, not the registers themselves. We've also been thinking a bit more about the Videl compatibility. During discussions with Peter Persson we realized that the Timer-B of the MFP-chip wouldn't work with our current SuperVidel construction. For this to work we have to feed the video clock of the old Videl into the SuperVidel and let the old Videl work as before. This way you'll get the old Videl picture out through the SuperVidel, as well as the Timer-B HBL-interrupts from the MFP correctly synchronized. In order to feed the old Videl clock into the SuperVidel, a wire will have to be soldered from the old Videl chip. Note that soldering this wire isn't a requirement for getting the SuperVidel to work, but without it the Timer-B won't work correctly in old games and demos. And it's only near the Videl chip that you'll have to solder. The other end of this wire goes to a small 1.27mm connector on the SuperVidel, for easy detachment. We have now successfully added the dual screen functionality. It has been tested at 1680x1050 16bit 60Hz, and seems to work fine. We get both the VGA and DVI signals at the same time, via the DVI-I connector. But since we currently don't have a DVI-I to DVI-D + VGA splitter, we can't actually see both screens at the same time. Time to order a splitter then... :P Henrik has continued researching the Videl register functionality, but no implementation has started yet. I'm currently investigating how the old Videl registers map to our new registers, in order to implement the most vital part of the Videl compatibility. The bypass system is now in place in the FPGA, which means that our video pipeline now works correctly together with the cache. Both the cache and the bypass system took a while to accomplish, because we're always working close to the performance limit of the Spartan3 FPGA (200MHz). Next thing is to incorporate the ST-RAM snooping that I (Henrik) started. The past week has gone to testing the cache some more plus planning the next step. We need some way of bypassing the cache when the videopipeline(s) want to read screen data, since we don't want these reads to fill the cache. That would hurt performance enormously. Henrik will start implementing the ST-RAM snooping, which is one important component of the Videl compatibility. Torbj�rn will start implementing the bypass unit mentioned above. After about 6 weeks Torbj�rn finally finished implementing the 32Kbyte cache and CT60-write-FIFO in the FPGA together with the necessary modifications to our internal DDR-controller and CT60-interface. This weekend we've tested it for real and it seems to work fine. Write accesses are now 100% faster than before and now we've reached 40MB/s (90MHz 060) during SINGLE longword writes (not comparable to the move16 bursts used when measuring the SDRAM performance of the CT60). On our oscilloscope and in simulations we see that the SV gives the 060 a "Transfer Acknowledge (TA)" already during the third cycle after "Transfer Start (TS)", thanks to our write-FIFO, but the 060 itself doesn't start another write until the ninth cycle. So it seems we can't optimize the single accesses any further. To get better performance we need to implement both move16 support and a DMA unit. A small problem with this is that you have to modify the VDI as well so it either uses move16 or the DMA unit (like the CTPCI). Otherwise the VDI will still do single word writes to the screen with sub-optimal speed. Reads are quite a bit slower (half) than the writes, because we get no advantage from our CT60-write-FIFO, so it's just our 32KB cache that helps us. Unfortunately, accessing the cache from the CT60 still involves quite long latency since the cache is close to the DDR controller and in the DDR clock domain. So the asynchronous bridging eats a lot of cycles etc. MOVE16 support will speed up this greatly though. Just a small status report. 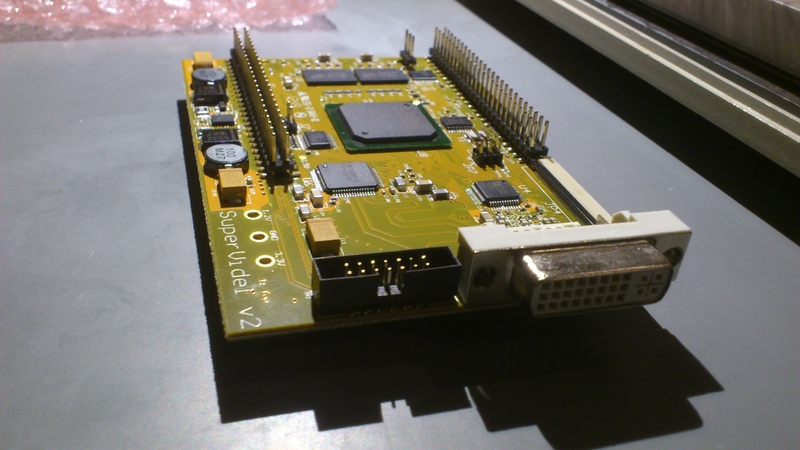 :) Torbj�rn is still busy with implementing the cache inside the SuperVidel FPGA, which will multiply the CT60s bandwidth to the DDR memory several times. This is also necessary in order to develop the ST-RAM snooping, which is a requirement for the Videl compatibility.